Rio de Janeiro in Brazil is a city which is great not only for sightseeing, but also for many outdoor activities. It is surrounded by beaches and mountains which make the landscape special. 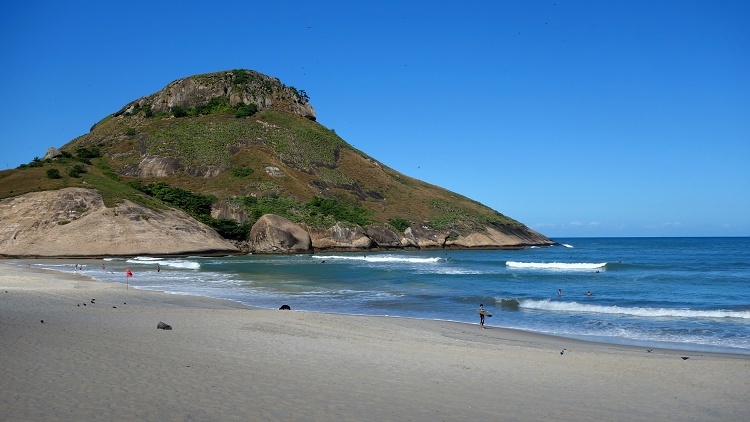 If you like hiking, climbing or water sports (like us), Rio is the place to go. No trip to Rio is complete without visiting Christ the Redeemer (Cristo Redentor). It is one of the New Seven Wonders of the World. 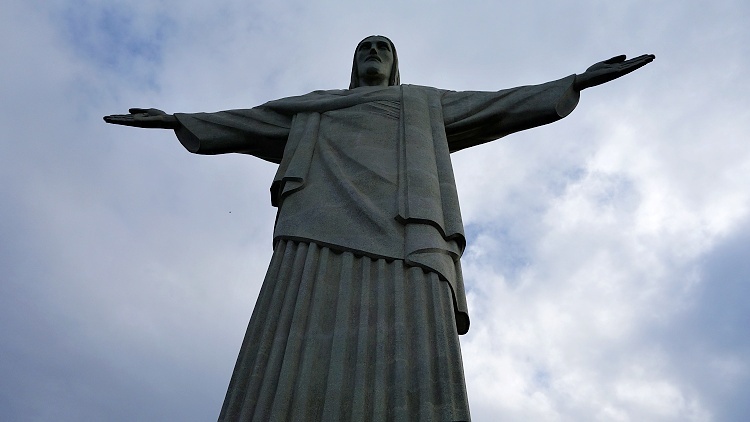 The statue of Jesus Christ is 30 metres tall and is located at the summit of Corcovado mountain (710 m/2330 ft). 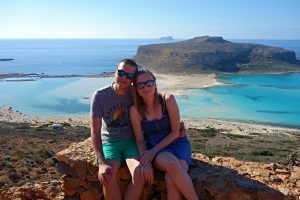 Skip the queues for the touristy train, save money you would spend on a tour, minibus or taxi, and hike there instead. The trail begins in the Parque Lage in the Jardim Botanico neighbourhood. You can get there by bus or taxi. It is a nice park where you can spend some relaxing time. At the trailhead you should register with the park rangers who will give you a map. The first part of the trail is easy and goes along a favela’s fence. When we were there, it was quiet and we didn’t meet anybody. The path leads through the jungle and it is easy to follow. It takes about two hours each way. Some parts of the trail are steep but the hike is rewarding. You will see beautiful sceneries, exotic plants, waterfalls and also cute little monkeys. When you get to the top of Corcovado mountain, you will need to buy the ticket to be able to access the statue of Christ the Redeemer. Be prepared for crowds and a lot of selfie sticks. If you are lucky with the weather and there are no clouds, you will get breathtaking views of Rio including the well-known Sugarloaf mountain. The one-way ticket to get back downhill on the train is expensive, it is almost the same price as the return ticket. We asked the waiting minibus drivers and none of them wanted to take us back because we didn’t have return tickets. But we didn’t mind and walked back through the jungle. Unfortunately, we underestimated the amount of time we needed and left the summit quite late. We arrived to the Parque Lage at dark which was a little scary because we could hardly see the path and we could have got lost in the jungle. Allow more time for the descent to avoid situations like this. Sugarloaf Mountain (Pao da Acucar), which is rising just off the coast in the Atlantic Ocean, is one of the most famous landmarks in Rio. 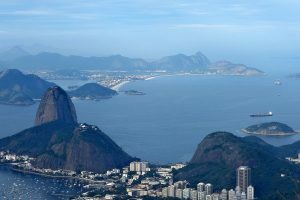 On the peninsula in Guanabara Bay, there are two peaks – the smaller Urca Mountain (Morro da Urca, 220 m/722 ft) and the taller Sugarloaf (396 m/1299 ft). The sunset is the most popular time to visit for a reason – the views are incredible. To access the mountains, most visitors use the cable car which stops at both peaks. We climbed Sugarloaf instead and it was one of our most memorable experiences in Rio. Unless you are an experienced climber and have your climbing equipment with you, it is better to join a tour with a climbing instructor. Some parts of the track can be tricky. It is not recommended to climb Sugarloaf after the rain because the surface gets slippery. The tour is suitable even for people with no climbing experience. The instructor will guide you and give you a hand if needed. 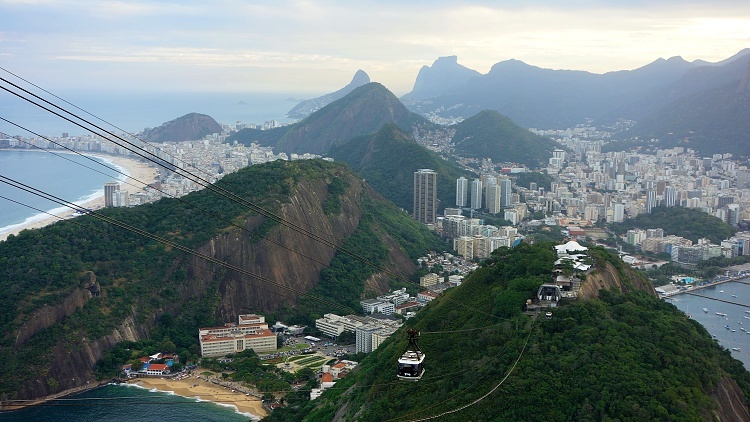 We did the Sugarloaf Mountaineering Tour with Rio Adventures and we really enjoyed it. At the summit of Sugarloaf Mountain, you will get amazing views of the Rio’s cityscape, Christ the Redeemer and the Copacabana beach. When you are ready, you can take the cable car back. We used it just for getting to Urca Mountain and walked downhill through the forest then. It was dark so headlamps came in handy. Make sure you are wearing comfortable clothes and hiking shoes. Bring plenty of water and snacks with you. Sugarloaf looks steep from the front but the climbing tours usually access the mountain from the back, where the trail is easier. Plan this adventure as a half-day trip. Sugarloaf is a beautiful mountain to climb. It is a great feeling not to join the crowds in the cable cars, but to conquer the mountain on your own. If you don’t feel comfortable with climbing Sugarloaf, you can just take a walk to Urca Mountain and continue by the cable car. The rock formation called Twin Brothers (Morro Dois Irmaos) is 533 m (1749 ft) high. It is located in the Vidigal neighbourhood in Rio. It is higher than Sugarloaf but lower than Corcovado Mountain. The views from the top include Christ the Redeemer, Sugarloaf Mountain and Copacabana, Ipanema and Leblon beaches. Be aware that you will need to go through the Vidigal favela (a slum) to get to the trailhead. If you aren’t comfortable with that, you can join a tour or hire a local guide. Vidigal is one of the pacified favelas in Rio. The entrance is located close to the Sheraton Hotel. We didn’t have any issues there, nobody was paying attention to us. We took the moto-taxi to get to the trail because the streets are really steep. Moto-taxis are cheap and you will support the local people by using them. It is also possible to use vans but they are more expensive and slower than the motorbikes. You need to get off at the football field and follow the trail uphill. The hike isn’t difficult and it takes about one hour each way. After coming back to the football field, we walked back down through the favela. To get to the bus stop on the main road, it is just a quick steep walk downhill through the narrow streets. 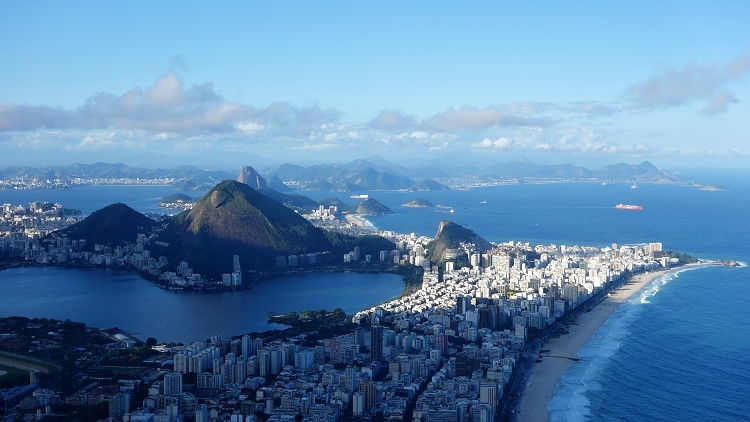 Rio is well-known for its gorgeous beaches, especially Copacabana and Ipanema. Cariocas (the locals) love spending their time on the beach. If the weather is right, the beaches can get really crowded. Cariocas look after themselves and you will see many good-looking people running or working out (not only) on the beach. There are many work-out stations available along the beaches. In the evening, when it gets cooler, many people join some of the outdoor work-out classes too. We aren’t beach bums but we still wanted to enjoy the ocean. We tried stand up paddle boarding at Copacabana and surfing at Praia da Macumba in the Recreio neighbourhood. We didn’t have any previous experience with paddle boarding but the staff explained us how it works. It is easy enough (if you can keep the balance). We are not experienced surfers and that is why we decided to join a group to learn some new tricks. In the end there were just three of us so we all got a lot of the instructor’s attention. 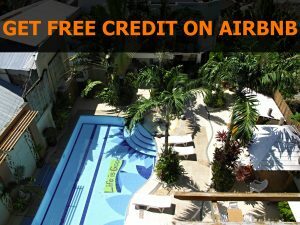 We chose the surfing school Surf n Stay in Recreio because the prices were lower than in the city centre. The district is located quite far from the main tourist area in Rio (the South Zone). To get there, you can take either public bus or taxi, it is about an hour each way. Travelling by bus might take forever because it stops often, but it is a really authentic experience. Be aware than English is not widely spoken in Rio, even at the most touristy places like Copacabana beach. 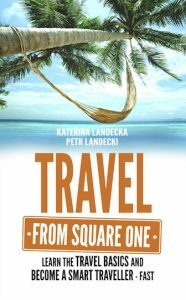 If you are planning to go somewhere on your own, learn at least some basic words and phrases in Portuguese. It is a good idea to have a dictionary or phrasebook with you, so that you can ask for help if needed. 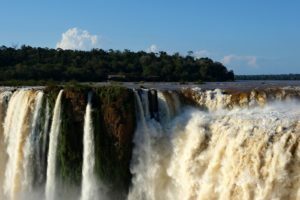 Iguazu Falls: Brazil or Argentina?